Did you know that today is World Smile Day? 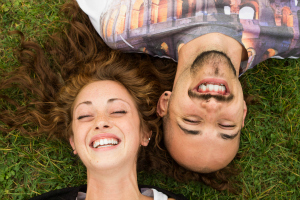 A smile is an extremely powerful tool that can make all the difference in your dating life. There are three keys to foolproof flirting and guess where I start… that’s right, with a smile! I’ve written about this before, but thought that it made perfect sense to revisit the topic. When you’re attracted to someone and want to let them know without stating the obvious, flirting is the best way to establish interest. The prospect of a casual touch of the hand or batting of the lashes sounds easy enough, but when it’s time to flirt, many people get frozen in fear or avoid any awkward reaction all together. Instead of freaking out about when to coyly touch your hair or brush against their knee, here are three easy and foolproof ways to flirt that melt anyone’s heart. Like I said before, it’s a powerful tool. Even the Mona Lisa captivated the world with her friendly expression, so why can’t you? A smile shows that you’re open, polite, and friendly leading that person you’re trying to draw in to feel more comfortable around you. Some say a picture is worth a thousand words, but a smile is worth a million. It shows you have a great personality and enjoy conversing with others. A smile can entice someone all the way across the room to speak with you. And, proven fact, when you smile you use less facial muscles than when you frown meaning it isn’t as much work for your body to appear friendly, but to look like a sourpuss expends more energy. Did you know that 7 out of 10 women list eye contact as the sexiest quality in a man on a date? As David Coleman, the Dating Doctor, says when you maintain eye contact—even if you aren’t interested or attracted to the the person you are talking to—it creates a feeling of respect and appreciation for the other person which, in turn, helps them to see you in a positive and caring light. When you give someone your full attention that they deserve when conversing they grow attached to your interest. Work on keeping eye contact with everyone—grocery store clerks, friends, relatives, strangers—so that when you do sit down with your date you can keep rapt focus on them, and they can start feeling more drawn to you. Laughing and smiling are not the same thing. You can smile when someone tells you a heartbreaking story because you empathize with them, but if someone is telling you about their grandfather’s passing you definitely cannot laugh. If you heartedly laugh when someone is telling you a funny story, not only does it burn calories (yay!) but it increases your blood flow. An increased blood flow can give you more of a glow without bronzer, help with digestion after a big meal, increase your libido for that 5th date, and it makes you seem like you have a great sense of humor and like to enjoy yourself. And enjoying yourself is the fountain of youth for all ages. If you use these three foolproof ways to flirt, even if you and your date don’t make a match, you will see how easy it is to encourage conversation and leave things on a positive note. If you happen to have a special chemistry between you two, these three techniques can seal the deal. Smiling, maintaining eye contact, and laughing shows that you’re a friendly, approachable person who can get along with anyone and is a pleasure to be around. So, in honor of World Smile Day, go share a smile. You never know where it could lead.